Dogs need toys to entertain them, otherwise, they get bored. When dogs are bored, they can be destructive. My dog is no exception. She can get into all kinds of trouble if not kept busy. 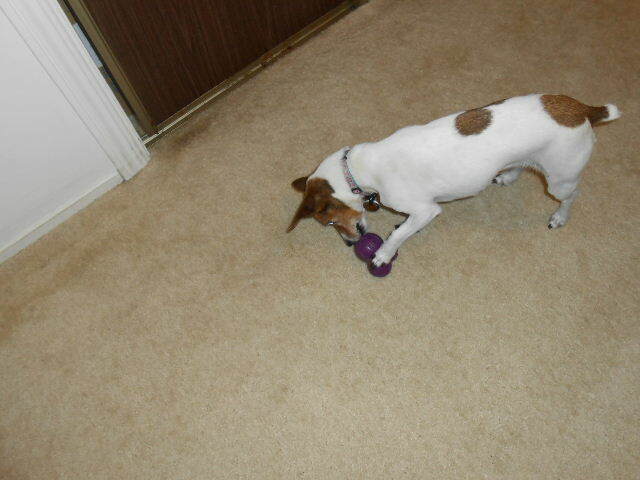 Treat toys are a great way to burn off energy and occupy a dog for several minutes at a time. The Busy Buddy Barnacle is a wonderful choice for this purpose. Misha is one of those dogs who tries to get into the Guinness Book of World Records each time she eats. She wolfs down her food so fast that I have to worry about her throwing up. I believe 5 seconds is her record for dinner…she doesn’t waste precious time on chewing. I feed her in treat dispensing toys so as to slow her down and prevent stomach upset. Even though she has four treat toys, she still eats in less than five minutes. I bought Misha a Busy Buddy Barnacle treat dispensing toy because it looked challenging. It quickly became one her favorites. The Barnacle is challenging which makes it a great choice to slowing down meals. The Barnacle is designed for the clever to the not so clever pooch. It is made of three different sized ball shaped spheres. Each has its own treat dispensing opening. Inside each opening are flexible rubber prongs that hold the treats in. Dog food or small kibble sized treats fit best. Put a few pieces in each ball and watch your dog wobble it around on the ground. Each sphere has a different level of difficult. It is adjustable. If a sphere is too difficult for your dog, you can cut off a prong or two to make it less challenging. Misha is pretty proficient at treat toys. She has developed different methods for solving each one. This is how she gets through them so quickly. While the large and small spheres are easy for her, the medium sized one gives her fits. It’s my secret weapon when I need to occupy her for a few minutes. There are different size barnacle toys for different sized dogs. I bought the small sized barnacle for Misha. She’s an 8 lb dog and it’s perfect for her. This dog toy is made of thick rubber. It’s very sturdy. Misha has had her Busy Buddy Barnacle for two years. No matter how much she licks and chews at the openings it has not deteriorated. I have not noticed any loosening of the prongs. It’s durable. Of all Misha’s treat dispensing toys, this is the one that takes the most time to empty. The three different treat meters means you can start on the easy level and increase to a more difficult level as your dog figures it out. You can fill all three at the same time, too. I like that it’s solidly made. After two years my dog has not been able to destroy it. It’s held up well to her abuse. My only word of caution is be sure to move it out of your walking path when your dog is not playing with it. It’s shape does not lend to rolling. It sticks to your shoe when you step on it or kick it. I have tripped over it a couple of times. You are forewarned. Move it to a safe place when not it use. My dog recommends this toy wholeheartedly! Disclaimer: I purchased the Petsafe Busy Buddy Barnacle on my own. I received no compensation for this review.